The Historial de la Grande Guerre of Péronne, France, in cooperation with the Australian Embassy, as well as with the support of Australian Minister of Veteran Affairs and the Australian War Memorial Museum inaugurates on Tuesday 23rd April, at 18 o’clock , a new exhibition entitled So far from home / Si loin de chez eux. 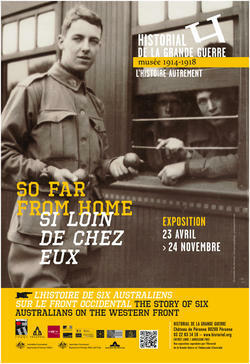 As the subtitle clarifies, this exhibition narrates the story of six Australians, who were engaged on the western front during the Great War. Their country, becoming an independent nation in 1901, decided to offer its support to England only on cultural and political grounds and joined the Allied forces from the beginning of the conflict. It refused however obligatory conscription, so that the Australian Army was made only of volunteers. We are talking about 417.000 people, among them 331.000 fought abroad. A first expedition corps – the Australian Imperial Force (AIF) – fought during the Dardanelles campaign, then moved on the Sinai and Palestine front. After Gallipoli infantry Divisions were formed in Australia, sent to France in 1916 and fielded by the British Army. The curators of the exhibition under the supervision of Prof. Jennifer Wellington, Yale University, choose five men and a woman and explores their different life-stories in order to tell us the contribution of the Australians during WWI. Six different persons, six different stories. Frank Grose, because of some sight problems, could not serve as a soldier, so he served in the YMCA and became responsible for the “well-being” of the 1st Division of the Australian artillery. He and his assistant, Sergeant Jack Conn, assured to the troops the chance to take a bath, to enjoy some music or to practice some sport, to receive cigarettes and chocolate, to read newspaper or to send letters home. Tom Cleary, instead, was a 39 years old electrician in Sydney before leaving for the French front 1915. He left his wife, enrolling as a volunteer, and recorded his war experience – which was also his only opportunity to venture and discover the world – in a diary. Much younger, only 18 years old, was Thomas Charles Richmmond Baker, from Adelaide, who served in 1915 in the Middle-East campaign. Had already spent few years in Europe, as a student in Oxford, instead Frederick Septimus Kelly from Sidney: able airplane pilot and gifted musician, he entered in the Australian Army. Another name, another story, that of Douglas Grant: he was an aboriginal, born in the mountains of the Queensland. As his parents died suddenly, he was adopted by Robert Grant and his wife, who found Douglas, still a baby, while searching in the area objects for the Australian Museum of Sydney. A talented drawers, Douglas Grant enrolled and fought in France during the WWI. The Exhibitions tells finally also the story of a woman, Elisabeth Pearl Corkhill, from Sud New-Wales, who started serving the Army as nurse in Egypt from June 1915. The exhibition will be opened 23th April 2013. Informative materials and audio guide will be at disposal to lead the visitors through the photographs and the materials. More information here.